Many people tell me that my blog sounds like a personal diary sometimes and I tell them 'Ya got no idea mate! '.Anush's comment for Chinnu's blog reminded of this question I used to get frequently. The fact is, just to set the record straight, I DO have a personal diary...ofcourse , one that is definitely not a blog.My dad introduced me to this wonderful habit of maintaining a personal diary at a young age of 8 years old- that is 1995.Hmmm, I know what you are thinking.But 8 years olds got feelings don't they?He taught me what I might want to write in it - anything and everything.I used to write like once in two days with a freakish little handwriting thats gotten freakier right now.I still take them out once in a while and go through what I had in my mind way back then. Over time, this habit evolved. 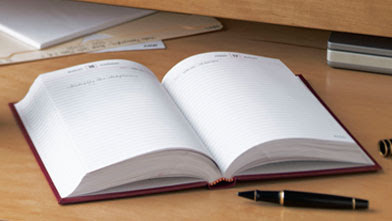 I write everyday now, I demand the best diary among the numerous diaries gifted...then I demand the next too. You see, one of them is a decoy...with a so-called maintainance which is supposed to make nosey people think thats the one- courtesy the fact that I found out that my parents used to read them when I was a kid. I never write any feelings in them, everything in it is very general and of no use to me in the future.I remember every diary I have ever used and I have well-hidden all the diaries that I wouldn't want anybody to touch. I don't see why a blog shouldn't be a diary.It all depends on how much you are comfortable of letting people know.It depends on how much secure you feel.It depends on how much you want to communicate.Some people just blog to look funny or cool, some just write lines with the toughest words you can find in the dictionary and make their posts as hard to understand as possible, just to show that their language is good.Some just brag on and on and onnnnnnn about things that would be of interest to a very small group of people and end up calling it a blog about their life.Thats hardly communication!Thats hardly a blog!! My blog is far far away from my personal diary and I doubt that either of them will tell you my complete story....a story that has just begun!! really 8years old?? hmmmm I think ur dad did a good thing...I think ill do the same for my kid...Most of my memories from tht age are washed away by the sands of time. hey guru.. very nice.. even i write diary.. i feel so good bout writing it..